Hand carved sandwiches served on fresh breads, daily soups, vibrant & crisp salads and much more! Café UTEC is way more than your average lunchtime eatery. 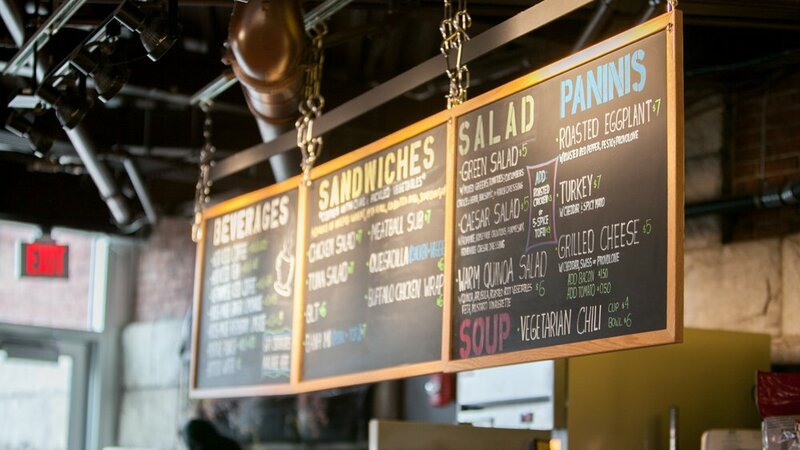 Enjoy a delicious panini, a salad of locally-sourced veggies and support UTEC's important mission. Authentic Vietnamese dishes, including vegetarian options. Tons of great food to choose from in a cozy environment. Heaven for those with a sweet tooth, specializing in marshmallows and s'mores. Mexican eats near UMass Lowell's University Crossing. High-quality pizzas, including gluten-free and vegan options. Hopping cash-only diner serving homestyle American dishes such as pancakes & burgers in snug digs. Market with deli sandwiches, chips, beverages and more. Flavorful cuisine of the Caribbean. Classic American foods, like chicken fingers and waffles, at a great price. Small, basic Chinese eatery whipping up sweet & sour dishes, egg foo yong & other classic fare. A family-owned pizza place using the same dough recipe since opening the doors in 1962. A quick spot to grab a hot dog or other delicious, quick food. Hearty plates of familiar Mexican fare & margaritas draw locals to this festive eatery with a patio.